"Short Report That Contains A Couple Of Techniques Backed By Science To Create A Connection"
Quick and easy to read (or listen to). Cheap price. Information is backed by scientific research. Will help deepen rapport and create a connection. Not actually going to cause women to fall in love with you the way it is claimed. Not every guy will be comfortable using one of the techniques here and it won't suit every style. Nothing really original here. This is a short report that contains two techniques you can use together that is supposed to make any woman fall in love with you. Realistically though, love doesn't just happen on the spot like this. Instead, the expectation that should be set is that it can help you create a strong connection with a woman very quickly. The techniques are similar to a couple that have been floating around the dating community for a long time now. They have been given a different name, and are structured in a way as to be specifically based on scientific research, but aren't entirely original. The report is decent value at this current price though, and if you're looking for more of a tactical way to create a deeper connection with women then this would be worth a read. Note: At the time of writing, this report is available for a discounted price of $9, and the value for money rating reflects this price. Depending on when you're reading this review and what the current price is, the value for money may be lower than what we have indicated here. 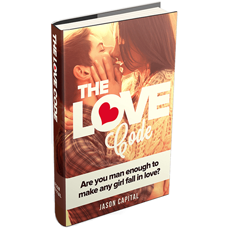 Jason Capital has written this short report, The Love Code, with the intention of teaching guys a quick and easy way to make women fall in love with them. It is based on scientific research from a university professor as well as Jason's own personal experience over the years with women. The product is a 17 page document as well as an accompanying audio file (the content is the same). So there's not really a lot to get through here and you'll be able to read it pretty quickly. At the start of the book Jason strongly recommends that you don't use these techniques on women who are married or have boyfriends. The reason being that it's very powerful and there are plenty of single women out there for you to go and meet. Also if you steal a woman from another guy you never know how he might react. So you want to use this with single girls and you can do it anywhere that the two of you are alone. If it's a girl you have met in a bar that night, you would need to isolate her somewhere reasonably quiet, and Jason talks about how to do this. The ideal situation though is probably when you're out on a date together. The other thing to keep in mind is that you only want to use this after a girl is already attracted to you. So if you're not able to consistently attract women then you should check out Jason's beginner course as well, Make Women Want You. There are two techniques taught here, the Cherry Game and one to 'lock in love' that goes by another name that I can't reveal here. The idea is to use the Cherry Game first and then the second technique will help strengthen the connection you have created. Now if you're at all familiar with the 'Questions Game', originally taught by Mystery, then the Cherry Game will sound very familiar to you. Essentially it's the same thing, but in the Cherry Game Jason gives you three specific questions to ask that are supposed to help create that connection. After you have finished with the Cherry Game, there is another technique you can do to help lock in and deepen the connection you've created. Now this one is very similar to a technique that was discussed many years ago by people in the Speed Seduction community. I believe it was Ross Jeffries who first came up with the technique. Jason's version here is too similar for it to have come from anywhere else. It's possible that some guys won't feel as comfortable using this particular technique, as it might feel a bit too intense or new-age. From my own point of view, I wouldn't use it the exact same way it's suggested here simply because it doesn't really fit in with my style. But that's not to say that it isn't effective, or that it won't fit in with your style. What I would personally do instead is take the core concepts and find a way to make it my own, so it feels natural for me. And this won't be hard to do as Jason has a conclusion at the end of this report that sums up the particular study this is all based on. The professor who conducted the experiment found conclusive evidence that the techniques mentioned here led to strangers feeling a deep sense of connection afterwards. So you could take the core lessons from here and find other ways to incorporate them if you wish. For example, I've never played the Cherry Game before but I have asked very similar questions just in getting to know women and it's an effective way to create deeper rapport. Will you really be able to make women fall in love with you on the spot from these techniques? It's highly doubtful, simply due to the way that most people experience the feeling of falling in love. It's not really like flipping a light switch on and off so you can't control it in that manner. Women are more likely to fall in love with a man who consumes their thoughts, which means she's also investing in you while you are not in her physical presence. If you approach this product with realistic expectations than it could be beneficial for you. It's just a tool you can use to help speed up the process of creating a connection with someone, not a magic pill that will make anyone fall in love with you. If you accept this fact, you're more likely to be satisfied with the product. The techniques are similar to a couple that have been floating around the dating community for a long time now. They have been given a different name, and are structured in a way as to be specifically based on scientific research, but aren't entirely original. The report is decent value at this current price though, and if you're looking for more a tactical way to create a deeper connection with women then this would be worth a read.